I feel like recently I have been taking big leaps when it comes to my wardrobe! I am noticing my wardrobe dominated by neutrals slowly getting pops of color in it! In recent shopping trips my eyes are drawn to the bright cheery colors that is dominating this seasons pieces! I am loving this sudden need for color in my wardrobe, and the bright colors are making even the dullest winter days just a bit better! But color isn't the only thing making a debut in my closet, for the first time I am incorporating patterns into my daily fashion! So here are a few of this weeks loves that have trickled into my closet! A classic tunic in navy, and I am loving the paisley print! I can't wait to wear this with a taupe pencil skirt, or even skinny jeans and Tory Burch flats for a classic low key look! I really went out on a limb with this next piece but I fell in love with the color (not like me at all). My mom sister and I will be matching once spring hits (yes we all bought it)! I wish it was warm enough to wear it now! I have mentioned my love for my red pencil skirt before, but it maybe one of my favorite pieces to wear to work right now. The nice pop of color is a nice change to my typical black pencil skirt! I recently paired it with this top from Talbots (Not just your moms store anymore, they have some seriously cute classic pieces)! Maybe little by little colorful pieces will start taking over my closet! Tell me about your style! Do you like neutrals or are you all about the color? What is one of this seasons colors you have to have? that lace top is gorgeous.partners are posted. Go check it. Love that red skirt and pink jacket! They look absolutely fabulous!!! The pink jacket is a total staple. Smart choice. Talbots? Who knew! That top is adorable! My closet has far too many neutrals in it- I need an over haul! love all the pieces you bought/have! so pretty. and that top from Talbot is gorgeous! and i feel like i need a red pencil skirt in my life now. That pink trench is way too perfect for me. Must have! I LOVE that pink trench! I stick to lots of solids, but I also really love stripes, plaid, and gingham! OMG, I love your fashion posts. Where is the pink coat from? If you don't mind, can you please mention the store and a link if it isn't too much trouble. :-) I also love that Talbots top, who knew their style changed. Also, I love both neutrals and color, but I tend to always buy black and navy blue and white/beige. So now when I see something I like, if I "love" any other color but black, I force myself to buy a color rather than black. Personally I love hunter green, but orange is the color of the season. Great great post! Thank you for the sweet sweet comment! I am loving the new pieces! I have provided the links for the pink jacket and the first top! 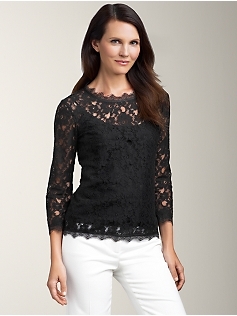 I will have to go to the talbots site later and try to find the lace blouse! Love that first blouse! So sweet! Love that red skirt! That definitely needs to find it's way in my closet! cute cute post! I love that red skirt! color is so in right now! We have the same style! I love all of these, especially the coat and the lace top! I love classic pieces that never go out of style! Love love love the trench, the pencil skirt, and the lace top! !